English Cherry Laurel is the shrub of choice for deep shade in all the warmer parts of the country. With beautiful glossy leaves that look great all year round, this is the perfect plant for filling shady corners or making privacy screens and hedges in shady areas. It will also thrive in full sun, so for a hedge or screen that has mixed light levels, look no further than this bush. This dwarf variety will not take over the garden, as older full-sized varieties can. It needs much less trimming, or even no trimming at all, to make a solid barrier six feet tall and up to six feet wide. Of course, it can also be easily trimmed to a smaller size as needed. This plant has no pests and diseases and will thrive will little care in a wide variety of conditions. English Cherry Laurel is the ideal plant to fill those awkward shady corners of your garden with an attractive, trouble-free plant that looks great all year round and will fill the garden with flowers and perfume every spring. Throughout all the warmer parts of the country, this is definitely the ideal all-purpose shrub for low-maintenance gardening. Sometimes in the garden we need a solid, evergreen plant to fill dark corners and give us dense hedges and barriers. We often also need dense, quick-growing shrubs to fill beds and provide an attractive green background to our more colorful shrubs. In organizing a garden the wise gardener uses plenty of green, to make a stable, calming picture. Sometimes we can achieve this with narrow-leaves, conifers, but sometimes a glossy, larger leaf works best. 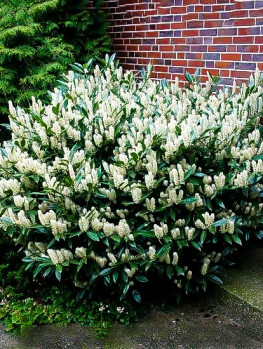 If this is what you need – and everyone needs it somewhere in their garden – then English Cherry Laurel is the tree you are looking for. 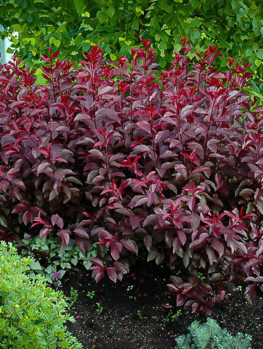 It has bold, glossy leaves in a medium shade of green, that always look healthy and fresh, no matter what season it is. It will grow in all exposures from full sun to deep shade, so a hedge can pass through different conditions and yet give a uniform effect. Unlike the full-sized laurel, this shrub does not need constant pruning to control its wild habits. 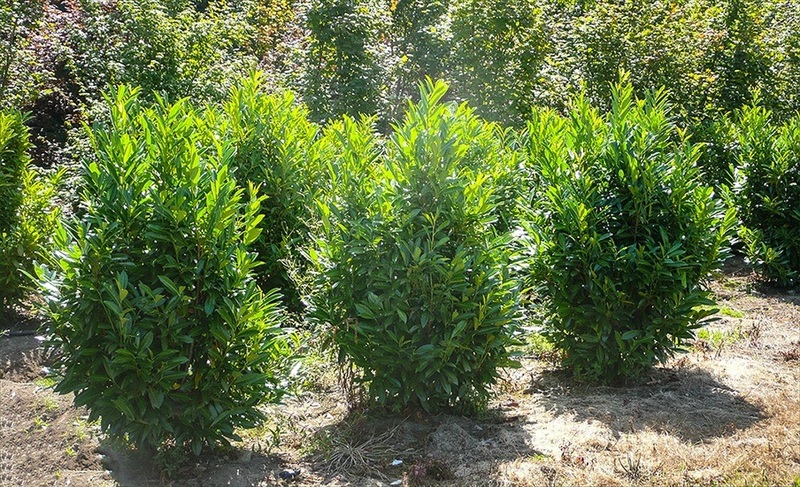 The English Cherry Laurel will grow rapidly, but only to between four and six feet, the ideal size for most hedges, or for background plantings in beds. It also produces fragrant clusters of small creamy colored flowers in spring, filling the air with a sweet perfume – an bonus on an already valuable shrub. Almost every garden has areas of both sun and shade. Yet plants that thrive in shade are hard to find, and ones that grow well in both are even rarer. It is often exactly in the boundary areas of a garden where the most shade is, or where varying areas of sun and shade are found. Hedges are often needed exactly where the deepest shade is. The English Cherry Laurel is a remarkable plant because it does thrive in all light levels, without the leaves yellowing in the sun, and without growing weaker in the shade. This means that if part of your hedge is in full shade, that part will grow just as strongly as the areas in the sun. In full sun, in partial shade, and even in complete shade, this plant will do its job for you. Town gardens often have tough conditions, with air pollution and dust. You need tough plants to screen you from all that, and this is the top choice plant for just that purpose. Not only will it take poor soil and air pollution, but with its dense growth, it makes a great noise and dust barrier. For screening in urban areas, it truly is hard to beat. The English Cherry Laurel is hardy all the way down to minus 10 degrees, so it will grow well throughout zone 6, bringing it within the reach of many gardeners. It also grows well in warmer areas, all the way through zone 9. Equally at home in hot, dry regions, or hot, humid ones, it will thrive. English Cherry Laurel grows well in just about every soil, from very sandy ones to hard clay. The only thing it does not like is soil that is often wet or flooded. Equally, it grows well in both acid and alkaline soils. Whatever you have, the plants will quickly adapt, and grow well. 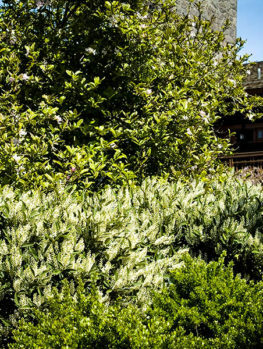 For hedges and screens, ‘fussy’ plants are not what you want. Particularly in those areas beneath trees, dryness is a real problem, that limits the plants we can grow, and even slows the growth of shade-tolerant plants. Once established, the English Cherry Laurel will tolerate long periods of drought without difficulty. Of course, during those periods, it will grow much more slowly, so it is always beneficial to water, but if you cannot, then your plants will still look great. Be aware that during the early years, particularly for the first growing season or two, plants should be watered each week during warm and hot parts of the year. Do not rely on natural rainfall, as this is often insufficient, especially beneath trees, which catch that water and block it from reaching the ground. Once they are well established, things will be different, and your plants will take care of themselves – fresh and green even during long dry periods. 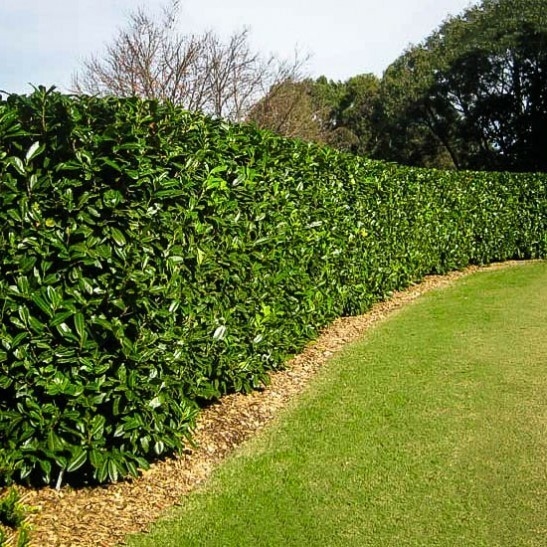 During the period when you are growing your screens and hedges to the height you want, it is best to water and fertilize regularly, to see the strongest and fastest growth. However, once they are more mature and dense, extended periods of drought will be no problem at all. Nobody wants to have to spray their plants – especially in this time of environmental awareness. The good news is that the English Cherry Laurel has few (if any) pests or diseases, and none of any importance. As well, although deer can be unpredictable, they usually leave these plants alone, so that is one less problem to worry about/ Always healthy, always growing well, this tree is truly trouble-free. The Cherry laurel (Prunus laurocerasus) grows naturally in Turkey, Iran and all around the Black Sea as well. The wild tree is normally a large shrub, with many trunks, but it can also grow into a tall tree. Some specimens have been found that are over 50 feet tall. 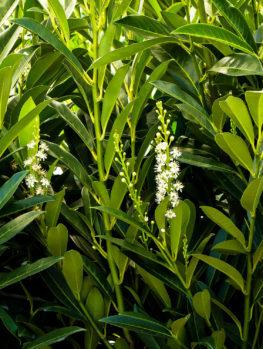 The evergreen leaves are large, thick and glossy, so this plant always looks attractive the whole year round. The leaves, which are oblong in overall shape, are up to 6 inches long and up to 2 inches across. When you start trimming your plant regularly, you will see that the leaves become smaller, adding to the attraction of this plant. Bright clusters of white flowers grow in spring, like upright candles, as much a 4 inches long. They have a sweet honey fragrance. These flower clusters will not be produced as much on plants grown for hedges, because of the regular trimming, but they are a spring feature on unclipped plants. Flowers are often followed by small black fruit that look a little like cherries and gives away that this plant, although very different looking, is actually a relative of the cherry tree. Despite its name, the black ‘cherry’ fruits should not be eaten by humans, although birds love them. The leaves are also toxic, so do not use this plant for a hedge if livestock can reach it. English Cherry Laurel will grow in any soil, tolerating poor soils, heavy clay soil, and urban pollution. It is best, if you want to produce a strong healthy plant as soon as possible, to add organic material like compost, peat-moss or rotted manure to the soil. Do this when preparing the area for planting. Give your hedge or plants plenty of water during the first few years. Once you have established them, and they have grown to the height you want them, these plants will tolerate – and even thrive – on almost total neglect, never needing watering or fertilizing at all. A great zero-maintenance plant. There are many different varieties of Cherry Laurel available. It is important to use the right one for your purpose, since some remain very small, while others will tower over your garden and need constant trimming. The English Cherry Laurel is ideal both as a background plant or specimen in shady areas, left to grow untrimmed to its natural height of around six feet, or trimmed into the perfect dense hedge. This selected form has been developed over years and it cannot be grown from seed. It is wise to avoid cheaper plants, which are often seedlings of unknown origin which will produce variable and uncertain growth. The trees we send you are grown by trusted experts, who work with material derived directly from the original plants of this variety, so you will get plants that grow exactly as described here. 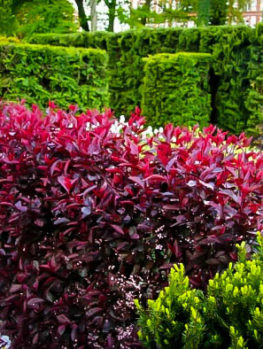 Every plant is identical, which means your hedge or screen will be uniform in every way, with no variations in foliage color or leaf shape. They will all be equally vigorous, with none growing out of control, or languishing as weaklings. It always pays to get the best. English Cherry Laurel is the perfect choice for planting a lower screen or formal hedge, growing well in either sun or shade. You can leave it to grow naturally, clip it lightly, or trim it into a neat, formal hedge. Unlike many other evergreens, especially conifers, if this plant grows too large, or you want to make a drastic change to its size, it will respond well, sprouting from old, thick, bare branches in just a few weeks. That means that if these trees become too large, you can cut them right back to the trunks and they will re-sprout quickly. Even if you neglect them for several years, they will not be lost. You can quickly reduce them in size and start again. Of course, this variety of laurel only grows to around 6 feet tall, so even left alone it will fit comfortable into smaller spaces. Dense, thick screens are often needed around a property, to create privacy and exclude dust, noise and pollution. If you need a lower screen, then the English Cherry Laurel is the ideal choice. It will grow to around 6 feet tall, and if unclipped it will be 6 feet thick, or even a little more. Some light trimming when plants are young will help encourage very dense growth, but even untrimmed trees become solid and impenetrable. If you want to grow a privacy screen, plant your trees between 3 and 5 feet apart. Planted closely your trees will fill in and give you a solid barrier in just a few short years. Planted further apart they will do the same in time – it just takes longer. Laurel in time naturally grows wider than it does tall, so a wider spacing is an economical option that will save you money, while still giving you good results, if you have a little more patience. For a neat hedge that you trim into shape, plant your trees 3 feet apart. For an extra dense hedge – ideal for screening out noise and dust, plant a double row. Space the rows 3 feet apart and the plants 4 to 5 feet apart, arranging them to form a zigzag. 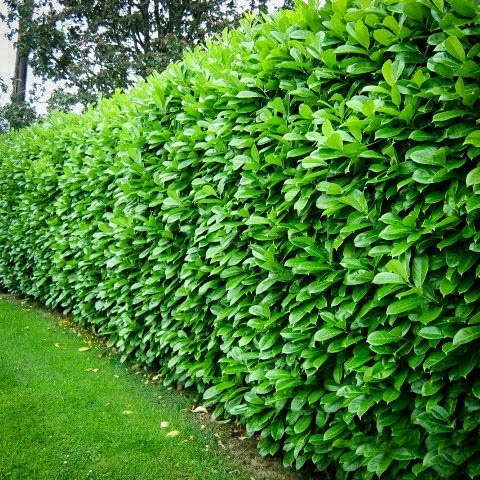 You will soon have a thick, impenetrable hedge guaranteed to bring you absolute privacy. For the best results, dig a trench, then space out the plants in a straight line along the bottom of the trench. Spacing is much easier to do in a trench than in individual holes, and the extra digging also opens up the ground for more rapid root growth. Space the first and last plants in the row half your chosen planting distance from where you want the hedge to begin and end. Doing this will give you the perfect hedge. This low care plant is easy to grow and needs very little attention to thrive in any garden. Here are some basic tips to help make that job even easier. Water your new trees once or twice a week for the first few weeks, until they are well established and started to send out new growth. Water thoroughly once a week, or every two weeks during cool and damp weather, for the first growing season. In very dry areas you may need to do this during the second year too, but after that, watering will increase the growth rate, but it is not necessary at all, unless you have very extended periods of heat and drought. Much will help conserve water and reduce the growth of weeds. Use a 2 to 3-inch thick layer, spread over the root zone. Keep it a few inches away from the trunk. In spring, add extra mulch if necessary. Don’t dig the old mulch into the ground, or rake it up, just cover it with an inch or two or new material. Feed your plants regularly during the early years with fertilizer suitable for evergreen trees and hedges. This will give you the quickest growth-rate and develop the strongest plants. Mature plants only need occasional feeding. Use granular or slow-release formulations and follow the manufacturer’s directions. Do not overfeed. Spring and summer are usually the best times to feed your plants. English Cherry Laurel is easy to trim, as it will quickly re-sprout, even from thick, bare branches. You can trim your trees anytime between spring and mid-fall, but avoid trimming before cold weather, as it can stimulate new growth, creating the potential for cold damage to that soft new growth. Young trees are best pruned with pruners, rather than hedge trimmers, to avoid cutting the leaves. Later you can change to regular trimmers to save time. For an informal effect, pruning is not necessary, but for a hedge it is important to start trimming when plants are still young, so that you develop a dense hedge that is not too wide. Do this by trimming the tips off the branches regularly, to encourage dense branching. Trim screens once a year if necessary, especially if you want foliage right to the ground. These plants naturally spread sideways and this shades the lower parts, so that a tree-like form eventually develops. To prevent this, trim the upper branches back so that the lower branches continue to receive light and remain strong and vigorous. Hedges should be trimmed two or three times a year, starting when your plants are still young. 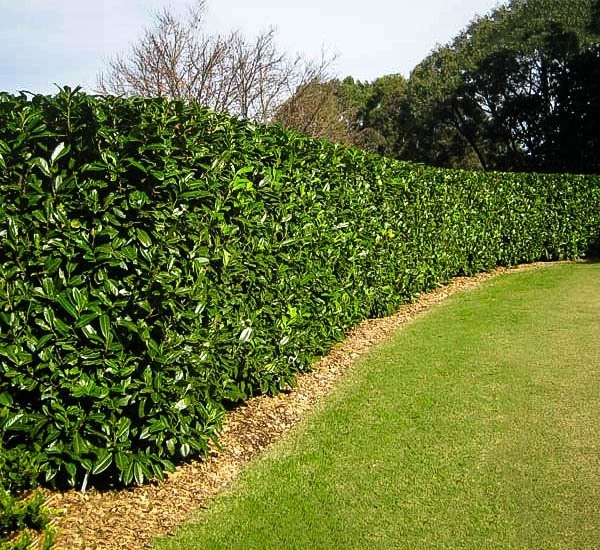 Trim the upper growth more than the bottom, so that your hedge leans inwards slightly. This lets light penetrate all the way to the lower branches, keeping your hedge thick from top to bottom. For a real work-horse around the garden, especially if you have a lot of shade, the English Cherry Laurel is the top choice. We constantly receive new shipments, but because of its great popularity, we can experience stock shortages. Order that hedge, or plants for your beds, right away, to avoid being disappointed.